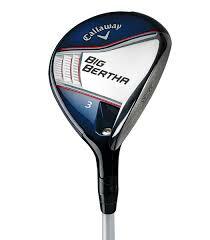 Callaway has created faster ball speeds all across the face of the new Big Bertha Fairway Wood from a thinner, lighter, more robust 455 carpenter steel face that gives the golfer more consistent distance and playability. In terms of adjustability, you can increase or decrease loft in 1° increments (up to +2° or down -1°) to optimise launch angle and spin, and you can also adjust to a Draw or Neutral bias to optimise shot shape. An internal standing wave precisely locates CG for more consistent launch, spin and distance across the face. Interestingly, Callaway has taken away the adjustability of the weight at the back of the head, as featured on the Big Bertha driver, but kept the adjustability in the neck. Shiny head out in the sun was a little off-putting for two of the testers. Neat chevron aids good alignment though, and the face sits nicely at address. White shaft with dark head appealed to three of the testers. Divided opinion as two testers mentioned they didn't get any feeling from good swings, but the other two said the Mitsubishi Fubuki felt smooth and consistent throughout. All testers agreed the ball sprung fast off the face, though. Solid distance and also forgiving. Decent spin rates for the majority of testers. The hosel allows for independent loft and lie adjustability, one of just several fairway woods to offer that. Ease of workability on offer from both deck and tee peg. A great worker off both turf and tee peg and a decent carry distance. The shiny crown divided opinion in the blazing sun but everyone agreed there was good alignment to be had. A bit of a low blow in the sense it costs £199, yet there's no question it packs a punch.